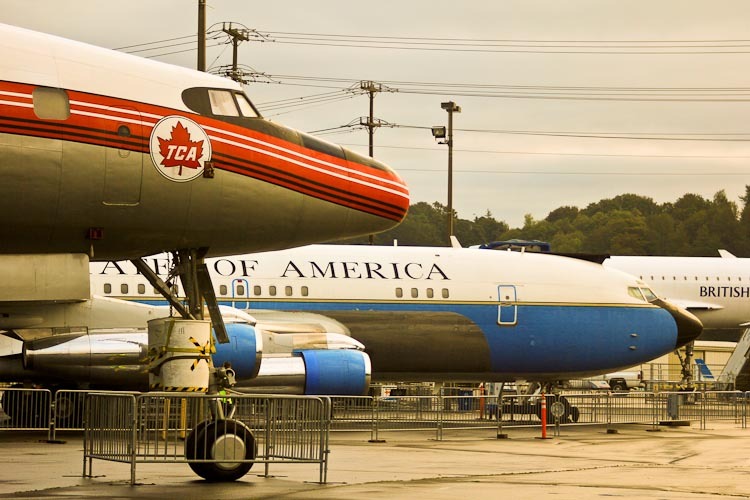 On September 15, 2009, TCA Connie CF-TGE, having been moved from Rome, New York to Seattle, and having been reassembled, was moved into Boeing’s Plant II for temporary storage and some additional restoration work. 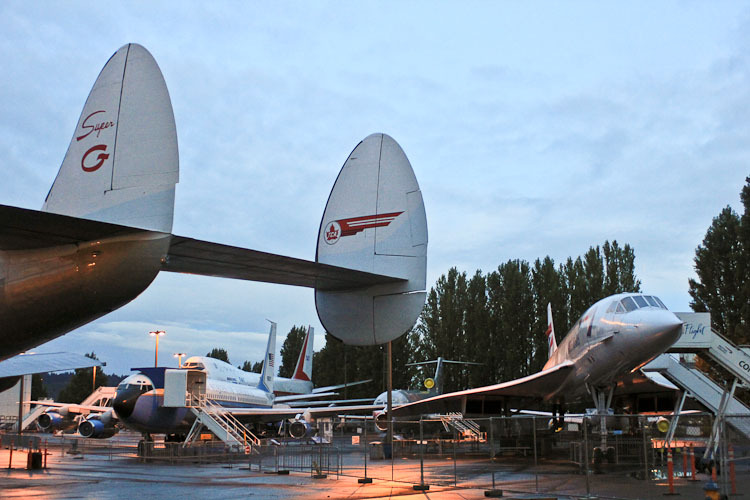 The Museum struggled with a suitable, and protected, display location for this important airplane. 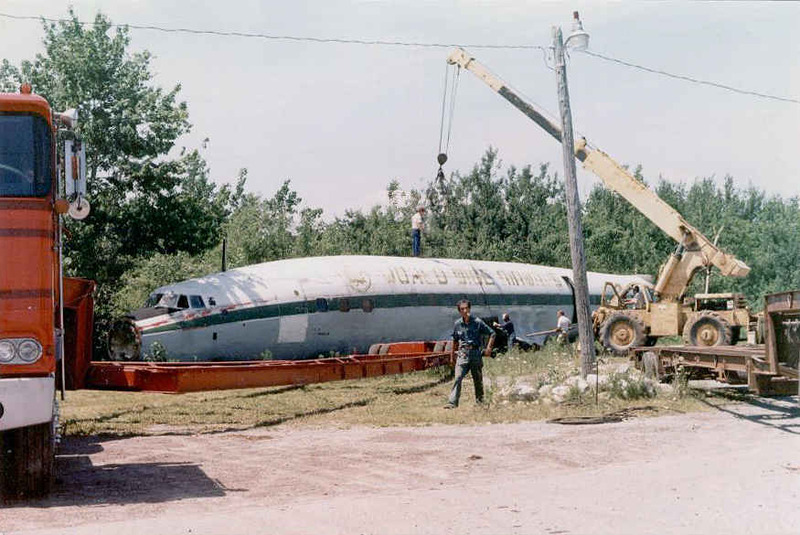 But, after a year, a magic solution was still not attainable, and it was decided to move the airplane to the Air Park. Not our first choice, but hopefully just a temporary one. During the year, the aft entry door was repaired, the fogged pilot windshields were replaced, the props were overhauled, paint damage from the move was touched up, and the cockpit was cleaned up. 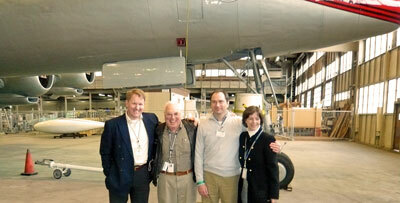 The airplane hosted many Museum members and some important VIPs. Unfortunately, it was not viewable by the general public; that was a personal frustration. The upside is that it was well protected from the weather. 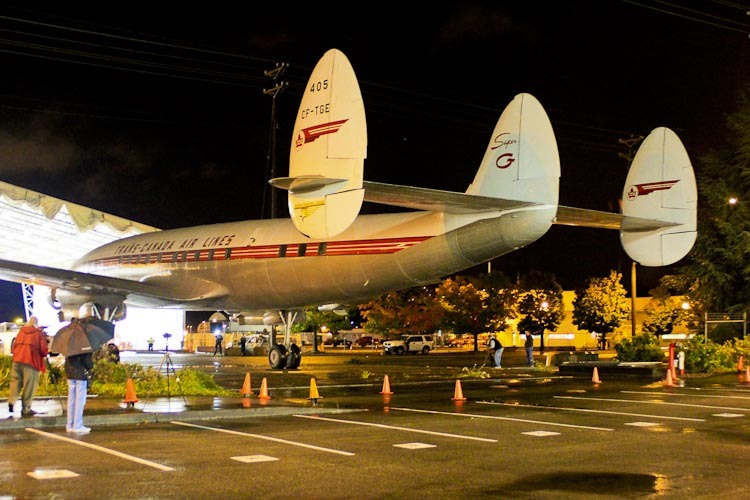 With Boeing’s demolition of Plant II imminent, the airplane was moved to the Air Park during two middle-of-the-night moves. Air Canada CEO Robert Milton came to visit with his family. Robert was crucial to the success of this project. 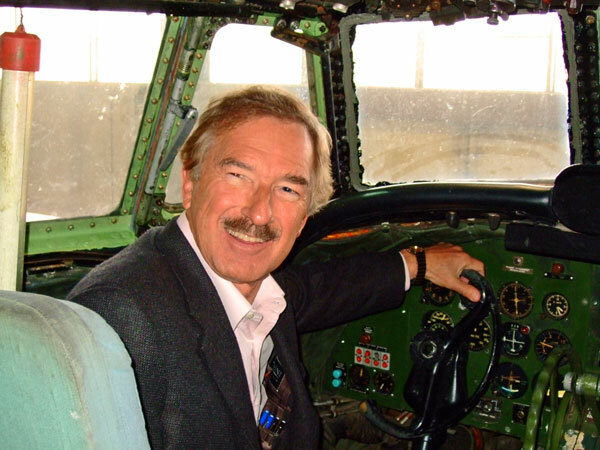 And so did Steven Udvar-Hazy, famous aircraft Mover-and-Shaker, airliner leasing giant, who provided the funds enabling the creation of the Smithsonian’s Dulles Airport facility that bears his name. 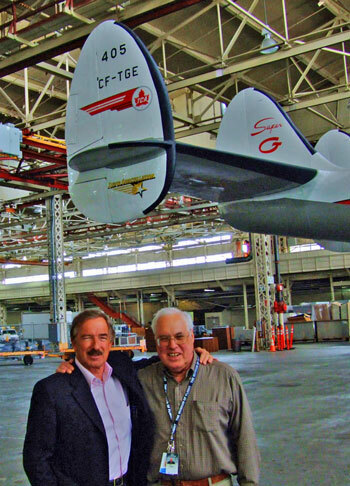 Both these gentlemen - as are ALL good airplane lovers - are also big Connie lovers. 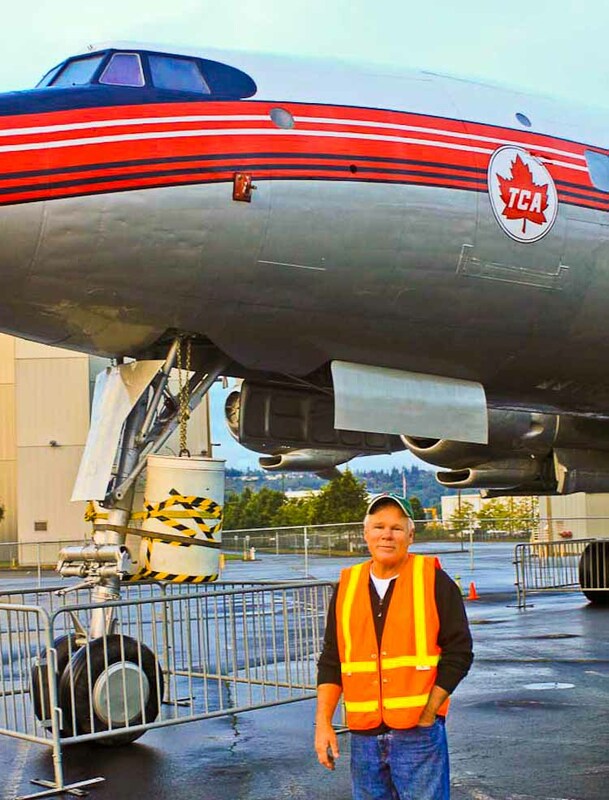 Good friend Chris Longridge, fellow Boeing retiree and Propliner lover, was instrumental in kicking off this project in July 2005, when he came to hear me give a talk on the 737 Prototype at the Museum. 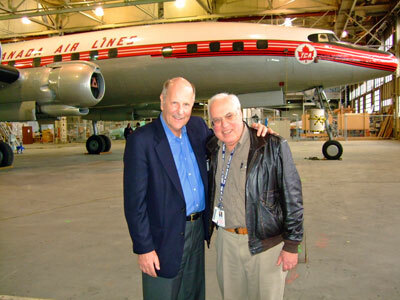 Chris's son David Longridge (left) - a Boeing salesman whose accounts included Air Canada was the key player in making this dream a reality. 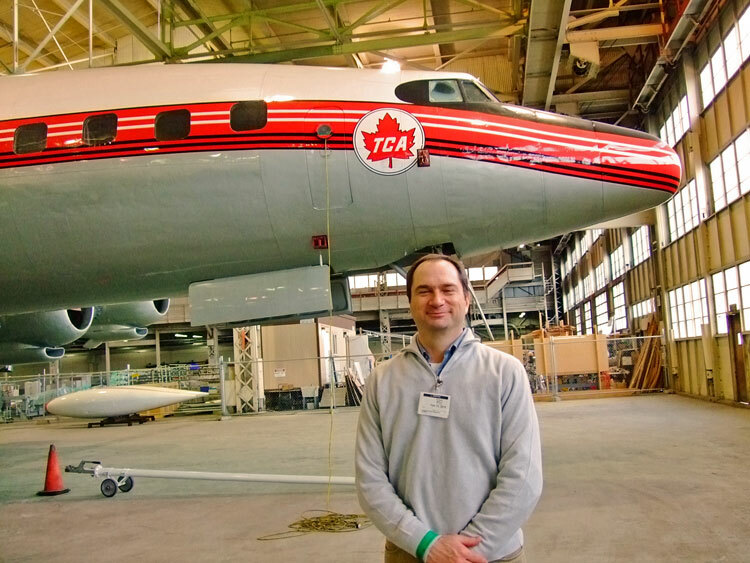 David came with Chris to hear my 737 talk at the Museum, then contacted Robert Milton, who offered Air Canada's help - and a free paint job! David continued supporting the project even when Air Canada was no longer his account. On the right is former Museum CEO Bonnie Dunbar who found the money I was spending prodigiously, fought with the Canadian government over our needed Export Permit, and gave great support to the project. She even put up with me! 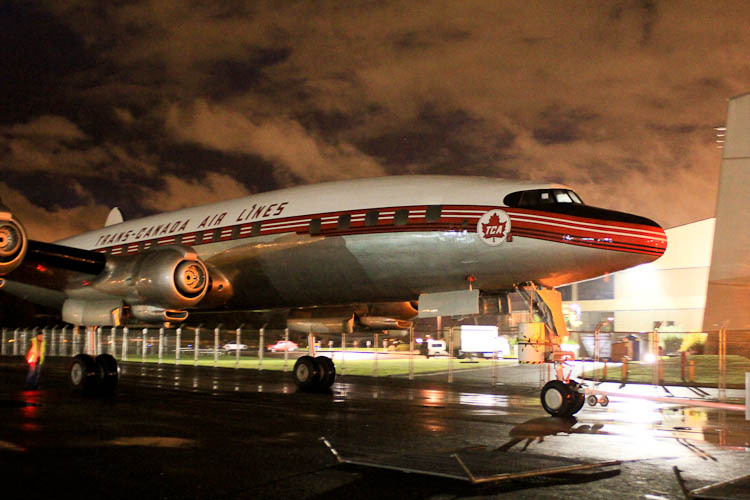 Three Museum airplanes were moved out on the night of Sept 18 - Connie CF-TGE got the first call. The B-17 and B-29 - her “roommates” over the past year, followed. 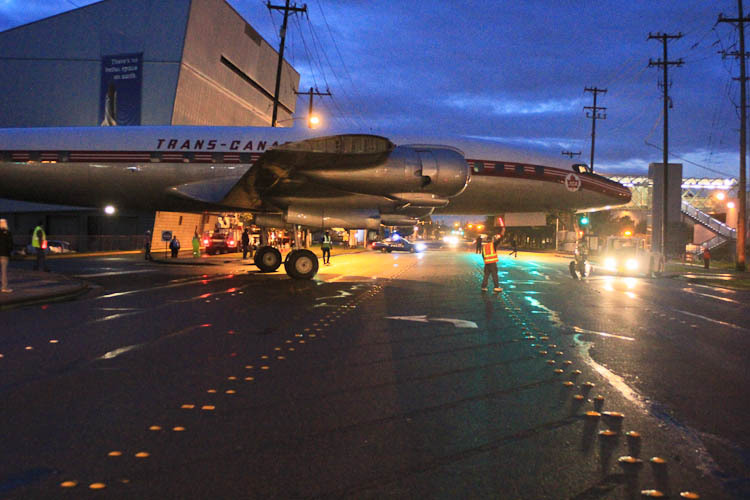 They were the last three airplanes to leave Boeing’s historic Plant II. See the story here. I came in, and, like the first night a year ago, leaving her alone, in this new and strange place, -- was the first to arrive and her only companion for quite a long time. The lights were out, the darkness enveloping, and we talked and communed in quiet contemplation. As best a human can “talk” to a machine, but - as you know - I think airplanes are “living things". (I've mused on this previously, for those of you who think it strange.) It's not difficult at all. I explained what was coming up. With 56 years of living under her belt - and - having endured the trials and tribulations of Job - and somehow survived - she didn’t exactly shrug. But, with her chin held high, she seemed to understand - she was going into a new world - one of deserved adulation - alongside some unique stable-mates - adored in their own right. She had endured and survived and triumphed over the years - survived after unimaginable neglect and abuse - to arrive at this new time in her life. Born again. As always, beauty and grace carried her forward with determination and nobility. After five years in her company, I am not surprised. She has the spirit of a true thoroughbred. Soon, the lights come on, people and equipment arrive - an extraordinary cacophony of sights and sounds surround her. Mechanics and Museum people and photographers from TV stations. Time for quiet contemplation is over. Looking back is over - looking ahead now consumes our thoughts. 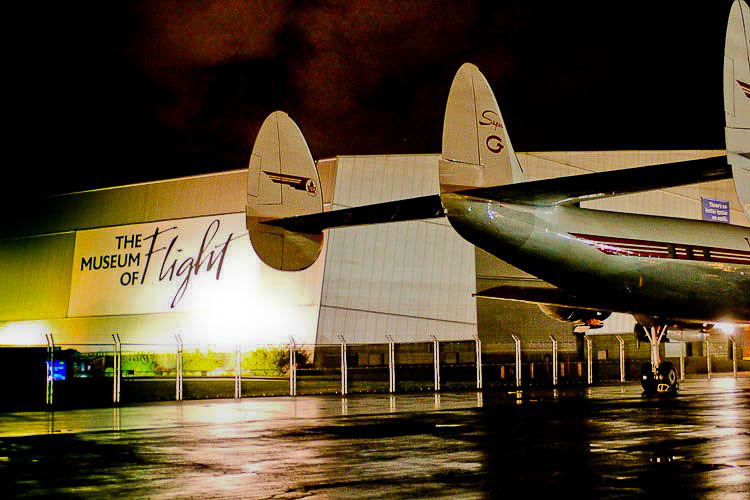 At 3:06 AM, she pokes her nose out of the hangar and starts her journey, leaving her warm and dry home of the past year. 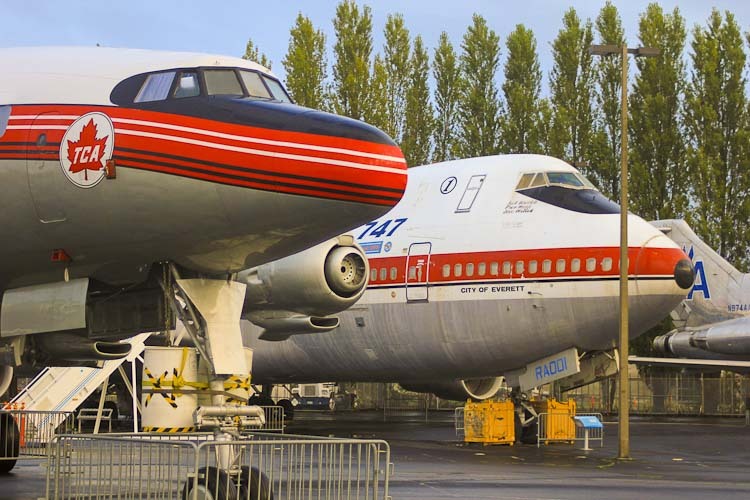 Bay 1 of the Plant II Assembly building (left) and the 2-25 Engineering building behind - a classic pose for so many historic Boeing airplanes of the past. 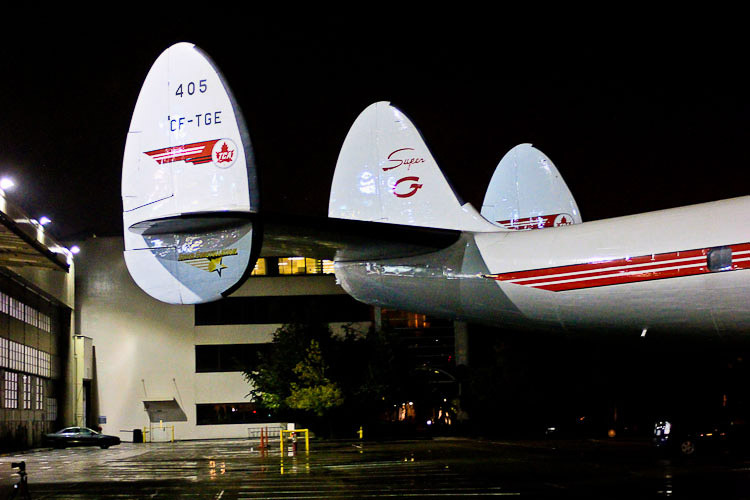 Now, the famous and beautiful Connie triple-tail adds her image to the photos of yesteryear. An amazing sight. Thank you, Boeing, for the great digs. Across East Marginal Way, through the Boeing fence and actually right through one of Boeing’s 737 flight line hangars and out on to the Boeing field ramp. 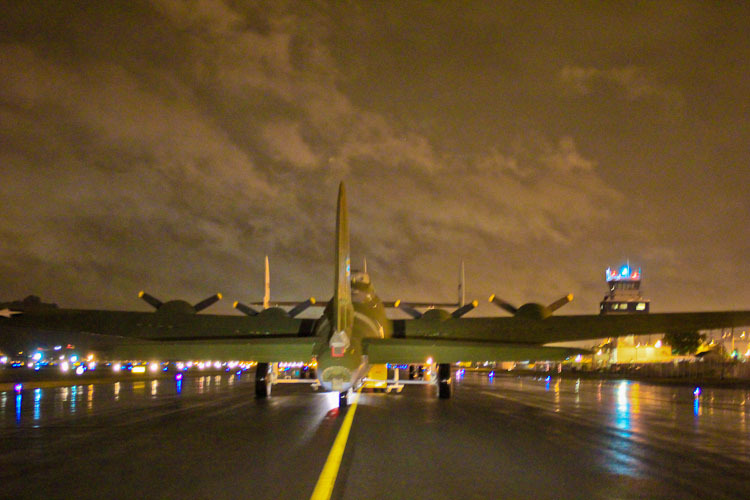 After all three airplanes that had been inside Plant II are on the field, the Connie and the B-17 are slowly towed down the Bravo taxiway to the Museum’s location. 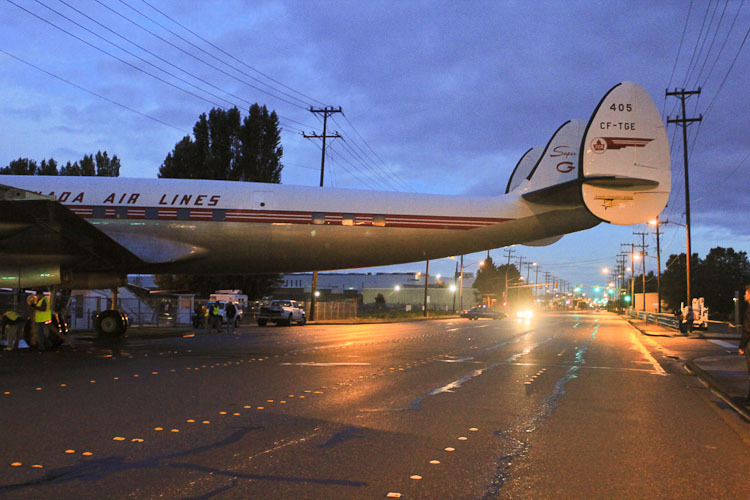 Last time it was on a flatbed truck - this time on her own landing gear. 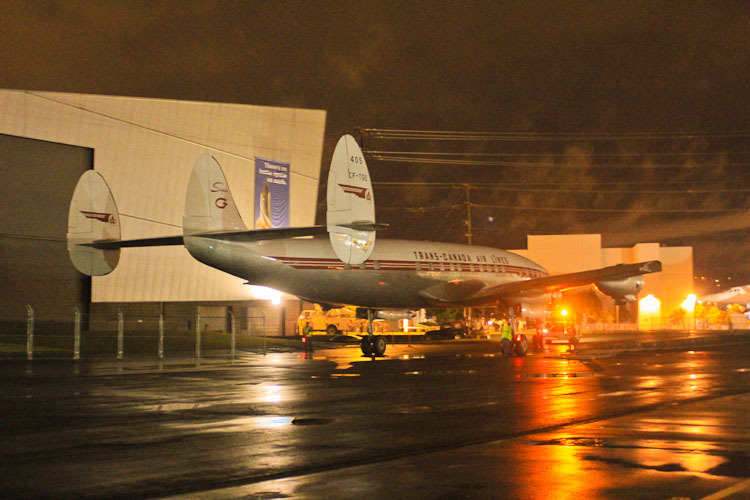 CF-TGE arrives at her staging location at 4:25 AM - a Super G finally at the Museum of Flight. 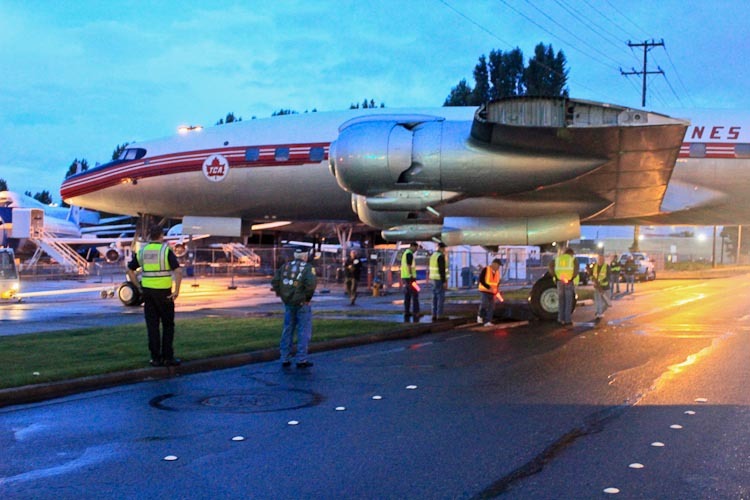 24 hours later finds us back on the dark and wet ramp, this time outside the Museum of Flight - our task to move Trans-Canada Super Connie CF-TGE across East Marginal Way once more, and into the Air Park for public display. Waiting quietly in the darkness, CF-TGE's final journey is about to begin. The tug arrives and hooks up. 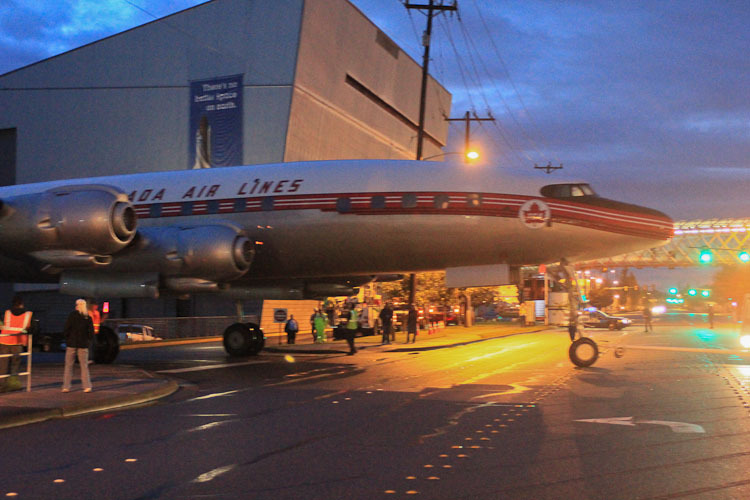 The airplane is moved up the ramp to the street. Fences and wires are taken down, curb cribbing and steel plates are positioned, (in fact, the entire Air Park admission building was removed), the police close the roadway, and the final move can begin. "Wow! 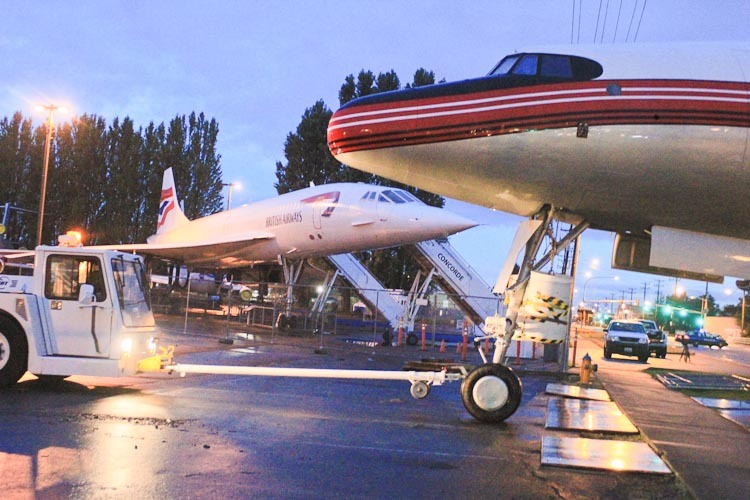 I've read about you - aren't you a.....a Concorde?" 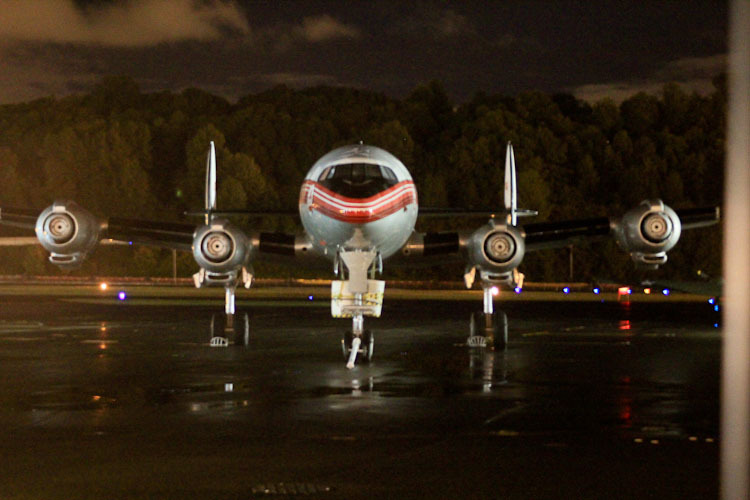 Past the other five airplanes, she's turned into position. She eyes her new neighbors, and they do likewise. 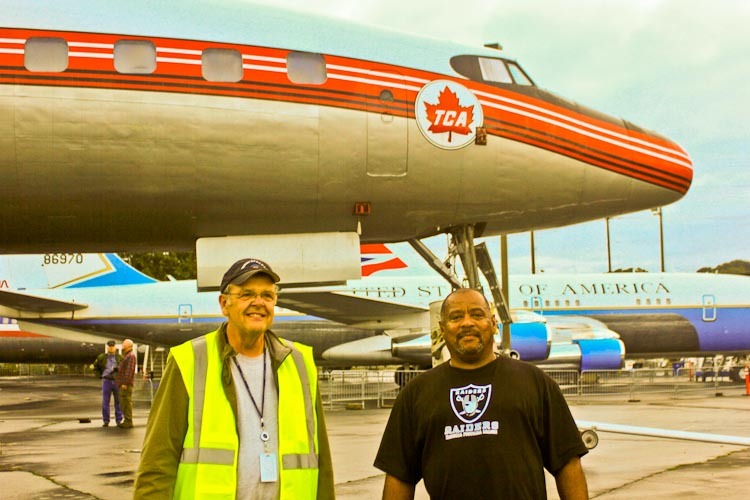 Here are the two members of the Ace Boeing towing team - Gene Slate on the left and Cederic Daniels - the tug driver. The tug is a high tech wonder of wonders, with independent four wheel steering, and the ability to even move sideways, and Cederic is its skillful master. Cederic has been such a whiz these days in moving “my” airplane, that I don’t even mind that he’s an Oakland Raiders fan! "Hey - aren't you the very First 747? 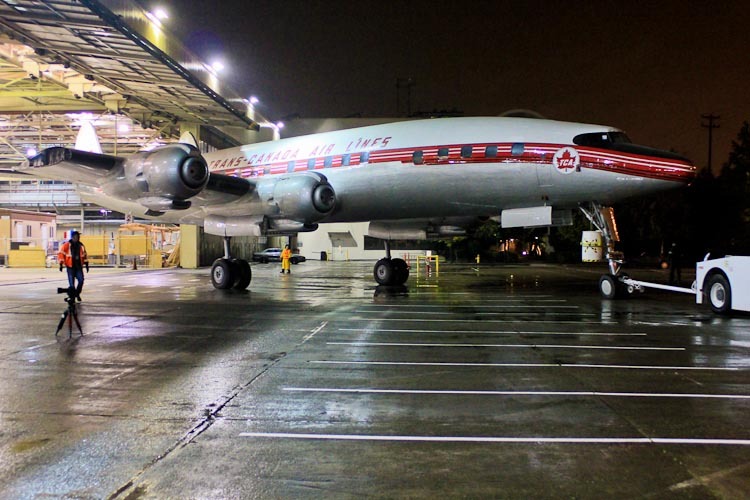 The First 'Jumbo Jet?" "Yep, that's me sister. 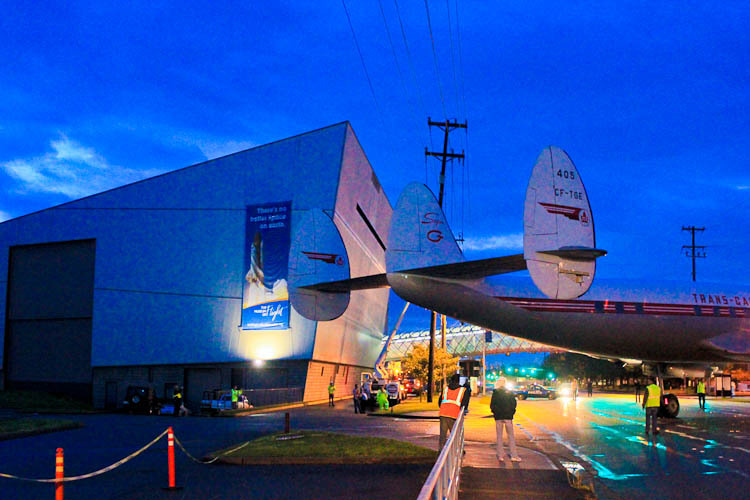 Welcome to the transport airplane Hall of Fame." "And, gee, didn't you used to fly the President?" "Many Presidents, if you don't mind. And Khrushchev too. They don't let just anybody into this place." “Boy”, she thinks, “these are some pretty impressive stablemates," her red nose blushing a brighter red. This is a journey over five years in the making. 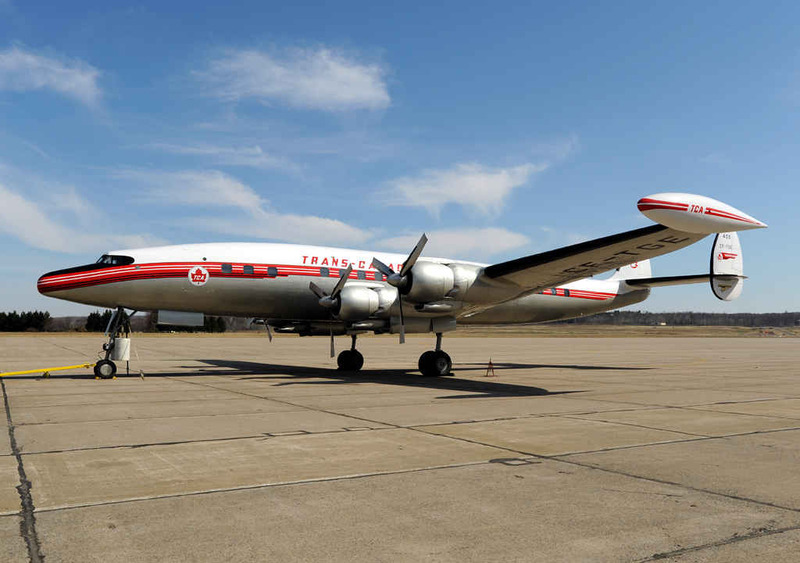 (My personal Super Connie quest for the Museum began in April 1978, involving three airplanes over a period of more than 32 years. As I said in my webpage The Real Story, “Although this one is a fight to get in the boat, I don't intend to let it get off my hook!”) With the help of innumerable people, providing support, money, and a lot of blood, sweat, and tears - this Connie has been saved - she has landed safely in the boat. I'm very proud to have played a part. The next steps? Install the props; outboard wing panels; tip tanks. Move the ballast from the two barrels on the nose gear to weights in the forward belly. Install missing external items - pitots and antennas. Eventually, install the four R-3350 engines we have on hand. Continue to work on up-grading the cockpit, and eventually, restore the interior. Like all airplane restoration projects, jobs without end. But, we have come far.....very far. 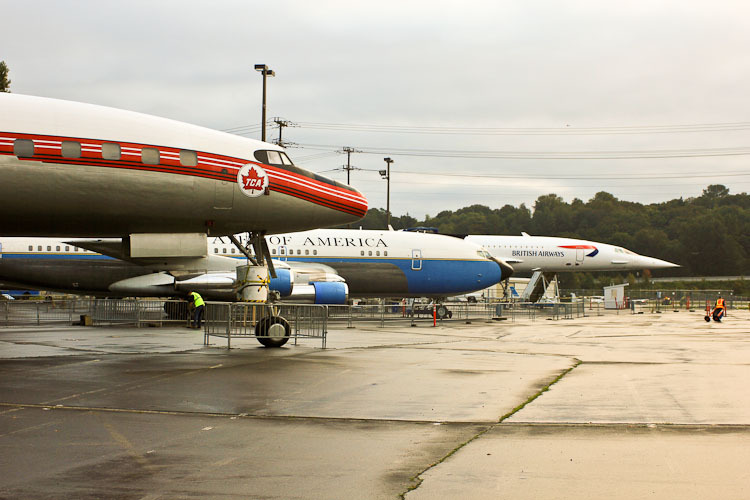 Back in March 2006, again in The Real Story, I wrote “The Museum will display the airplane outside - in front of the 747 Prototype and to the right of the first jet Air Force One (707. )” Four and one half years later, that prophecy has become fact. 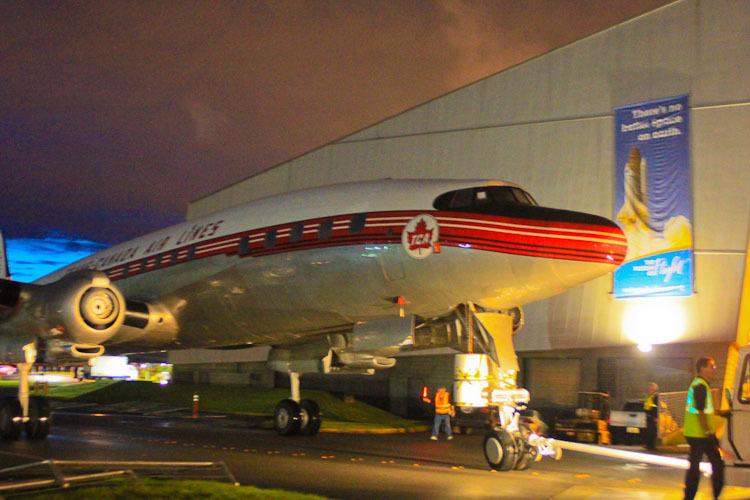 One of these days, the Museum will cover its precious large airplane collection - currently outside. 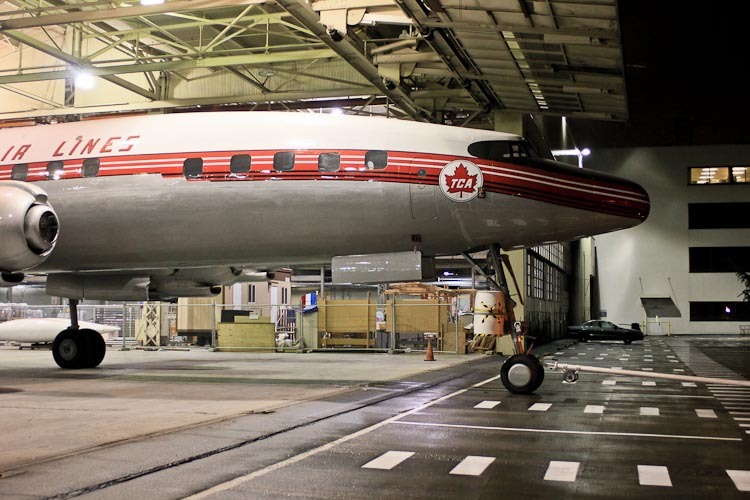 But until that happens, and even after, the TCA Lockheed Super G Constellation CF-TGE has indeed joined a select group of aeroplanes - with the 737 and 747 Prototypes, the first jet Air Force One, and the supersonic Concorde as her new neighbors. Like herself, everyone a Champion Thorughbred. Her 56 years of wandering are over. Click here for a photographic retrospective of those 56 years.